For me, learning a snowboarding 540 was very rewarding. My first snowboarding 540 was backside, and I fell in love with it right away. 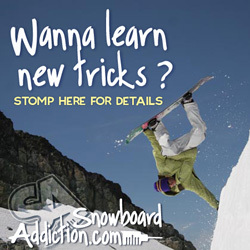 After that came the frontside 540, then the cab 540. For most the switch backside 540 is the hardest, but that varys from rider to rider. They are all fun. They all take waiting a little longer before winding up and snapping the take-off than a 360. Then, it is just grabbing the board and driving the spin around with your head and body. Don't be scared. Go out and stomp some 540s.